Ever wonder how Google knows in real-time which roads have traffic jams and which roads are clear? It may surprise you to learn that they get some of that information from YOU! 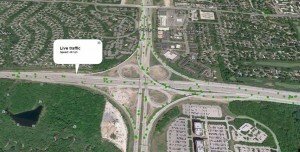 I’ve always kind of ignored Google’s real-time traffic reports thinking that they couldn’t possibly know what was going on and that they were just guessing or regurgitating data from those DOT traffic sensors embedded in the highway. I started digging around one day to find out how Google was doing it after I visited Denver for a wedding last November. I was on a side-street during a jam-up and decided to use my iPhone to try to find a way around. Google somehow knew there was a traffic jam right where I was! I looked around and could see no traffic cameras, no sensors in the road – nothing that would be reporting to Google. Somehow they knew where the jam-up started and where it ended. I was puzzled so I started looking around online to find out what was going on. That’s when I found a Google blog post discussing how they collect the data. Google collects traffic data from smartphones running the Google Maps app! Google is sent small, anonymous bits of data telling them your gps coordinates. From those coordinates Google determines your location, direction of travel, and average speed. 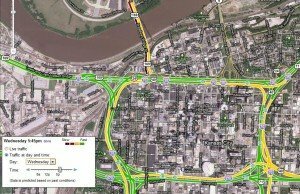 They combine that with data from other people on the same road and DOT sensors (if applicable) to come up with their real-time traffic maps. 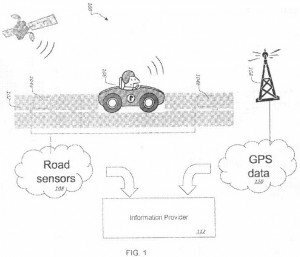 The screenshot below is from Google Patent Application US 2010/0286899 A1 and is a funny illustration of what data is collected and delivered to an “information provider” which transmits the data to Google. Another amazing thing is that Google also provides predictive traffic data based on previous data they collected. It’s a pretty sweet feature that is currently available at the bottom left side of the maps screen when traffic is enabled. You can see in the screenshot below that Wednesdays are ok for traffic in the KC area. They calculate their predictive traffic data based on past information they collected. 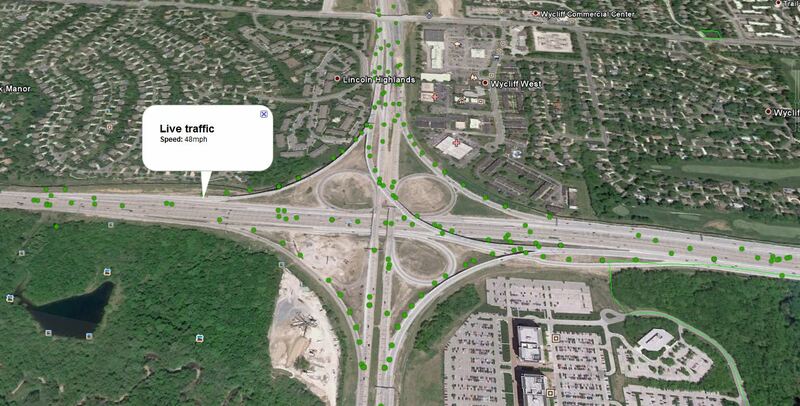 I used Google’s Predictive Traffic when I was driving to Austin in March to speak at Pubcon. I checked the highest traffic times in Dallas and timed my trip to miss it. (I have to go through Dallas at nearly rush-hour on my way from KC) It worked out great and I avoided the biggest jams. Google must be thrilled with the proliferation of smart phones and the fact that they currently have THE maps application. 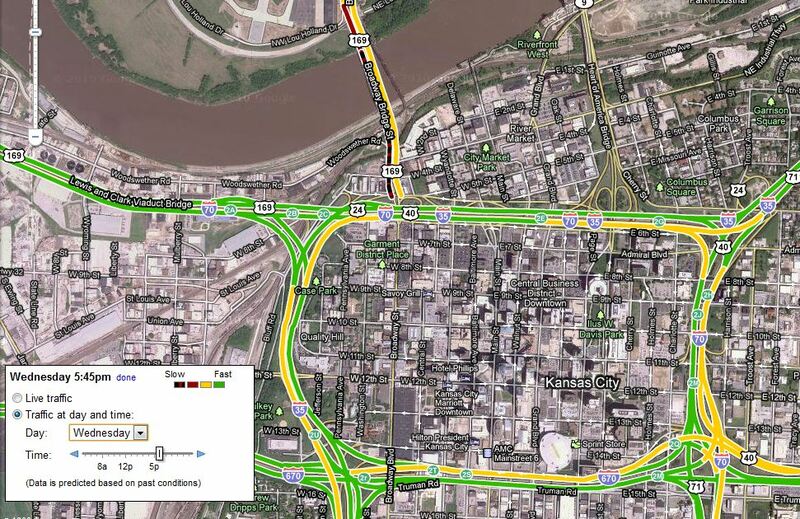 I’m remiss to have not pointed out the traffic data that you can get from Google Earth. Thanks to my friend Kirby for pointing that out. On Google Earth you can see a lot of little dots all over the roads. If you click on a dot it tells you the vehicle’s live traffic speed. It’s a VERY interesting thing to look at, and quite shocking to see how many phones Google can pull traffic from in real-time!